The Vancouver Condo Buzz » From $229,900! Final Phase at Vancouver Wall Centre Central Park Tower 3 Condo Residences! « From $199,900 (including parking!) The Heatley at STRATHCONA VILLAGE Vancouver Condos for Sale! Opening June! From $229,900! 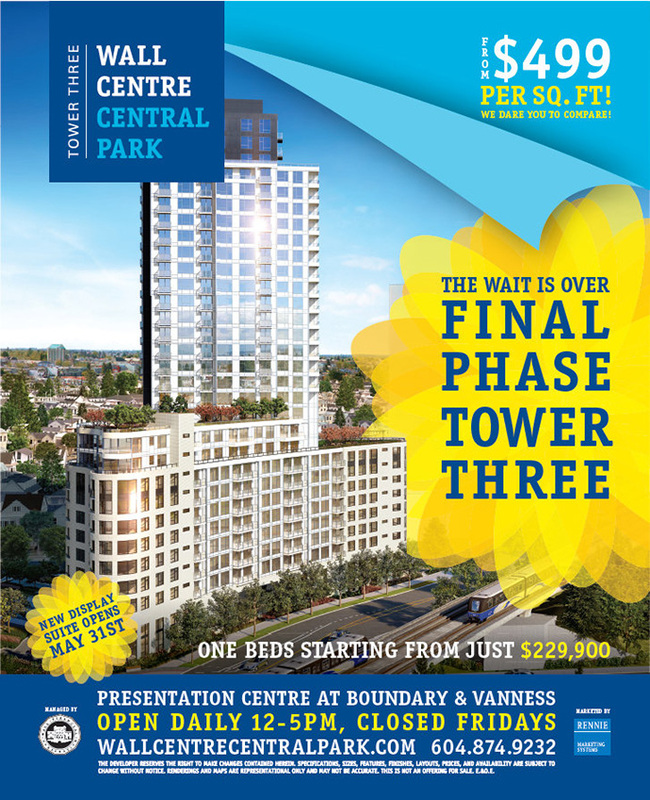 Final Phase at Vancouver Wall Centre Central Park Tower 3 Condo Residences! 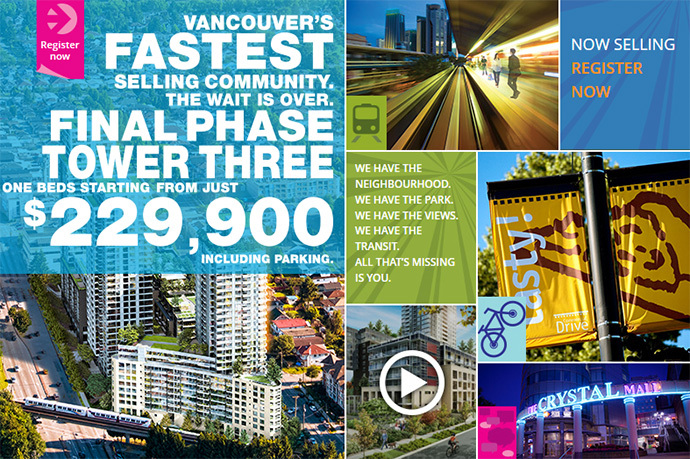 Vancouver’s Fastest Selling Condo Community Launching Its Final Phase! Vancouver Wall Centre Central Park final phase condo release is launching! With Tower 3 WCCP Vancouver condos priced affordably from just $499 per square foot, the developer and marketing team ‘dare you to compare’ pricing as nothing comes even close! The new display suite will be opening May 31st, 2014. 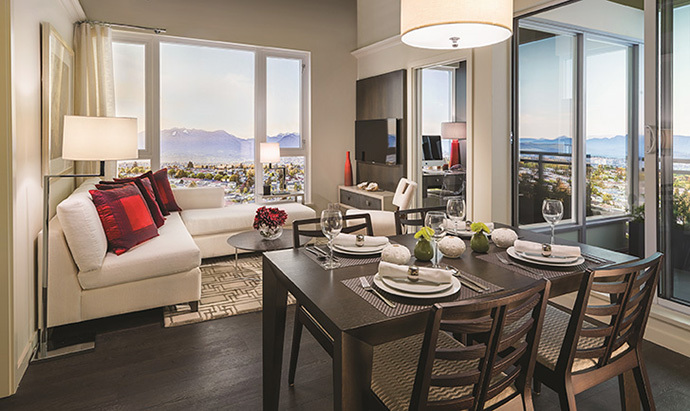 One bedroom residences start from just $229,900 and the WCCP Vancouver master planned community has already sold over 650 homes to date in the first two towers! The presentation centre for Vancouver WCCP Tower Three will be opening at Boundary & Vanness and will be open daily between 12-5pm except Fridays. The wait is finally over! The third tower in this transit-oriented master planned Vancouver condo community is just five minutes-walk away from the Joyce SkyTrain Station, making it clearly accessible to everything in the Lower Mainland. With easy access to Crystal Mall and Metrotown for dining, shopping and socializing, don’t forget about the Collingwood Neighbourhood House, big box retailers, boutique shops, services, banks and schools all within a five minute radius from your new home! In addition, one of the best features (we think) of the new Vancouver Wall Centre Central Park Tower 3 condo location is that it’s across from Burnaby’s expansive Central Park with tonnes of trails for biking and walking as well as picnic areas, lakeside relaxation places and much more! Designed to meet LEED Gold Standards, the new Wall Centre Central Park Tower 3 condos will be designed by Vancouver’s own GBL Architects. The contemporary concrete and glass tower will feature not only impressive finishes, but one of the best master planned transit-oriented communities that are affordable for today’s homebuyers. As well, WCCP3 Vancouver condos will feature impressive on-site amenity spaces for all home owners to enjoy year round starting with a fully equipped Fitness Centre (one dedicated to each of the buildings, so no sharing with other people!) as well as a beautiful outdoor landscaped space that is perfect for entertaining and gatherings. The presale Vancouver WCCP Tower 3 will also introduce an Exclusive Clubhouse for resident use only and it will include a 60 foot swimming pool as well as a hot tub. There are meeting rooms and secured underground parking with plenty of visitor parking as well. The community will be home to a new annex for the Collingwood Neighbourhood House, offering lots of exciting new programs for cooking, peer support, tai chi and much more. As well, the project will be green and sustainable, with garden plots in designated areas for growing organics as well as encouraging composting on-site. 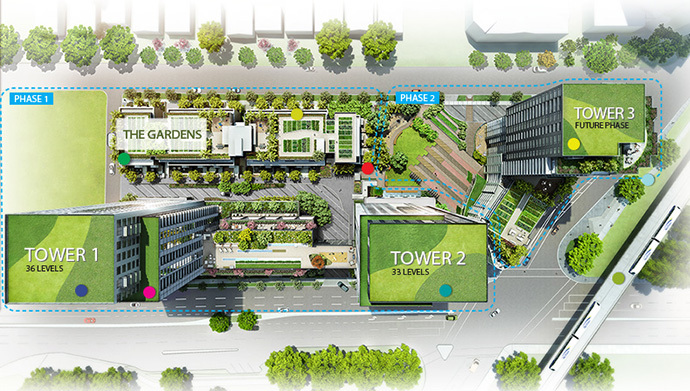 Also outside on ground level will be water features, tree lined streets and restful pathways for you to enjoy. For those of you who missed out on Towers 1 and 2 as well as the Ormidale Residences, the 3rd and final phase at WCCP Vancouver will introduce fabulous interior finishes in this striking glass and concrete tower. Some of the incredible finishes will include expansive floor to ceiling windows, stunning park, water and city views (depending on exposure and floor) as well as roller blinds that are both stylish and modern. The ultra wide laminate floors are beautiful and will grace the floors in the kitchen, dining and living rooms. The open layouts will also feature large outdoor living spaces. The bedrooms will have nature inspired loop pile carpets that are comfortable and very durable. The bathrooms at the presale Vancouver WCCP Tower 3 condos will introduce stunning marble stone counters as well as marble stone backsplashes in addition to ultra modern Grohe shower head and faucets, Duravit ultra efficient toilet and Duravit undermount sink (rectangular). There’s also a recessed wet rated halogen potlight and luxurious soaker tub with sleek and lasting finishes. The floors and wall will be covered by beautiful extra large format ceramic tiling and there are also deluxe custom cabinets with extra storage. The bathrooms at the new Vancouver WCCP Tower 3 condos will also have mirrored medicine cabinetry with lighting bar and Euro style frosted glass box vanity light fixtures. 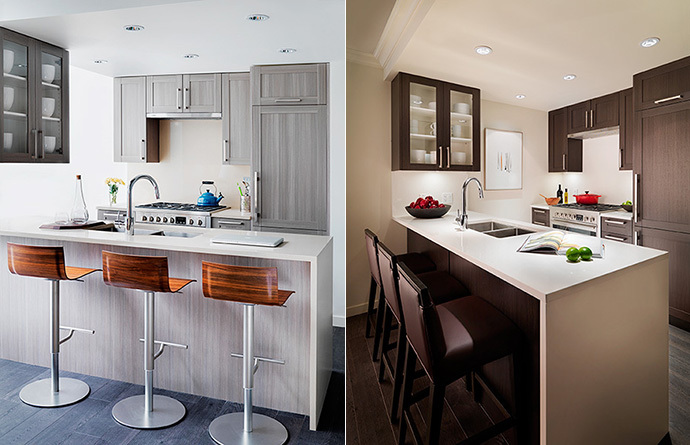 The smart and functional kitchens at the Wall Centre Central Park Vancouver Tower 3 condos for sale will introduce two colour schemes (Light and Dark) like the previous two phases of the project. WCCP 3 Vancouver will feature luxurious polished quartz slab counters and backsplashes in addition to durable shaker style cabinets in foil wrap wood and glass with contemporary brushed nickel handles. Also, other kitchen features include integrated front paneled Porter & Charles fridge/feezer, integrated front paneled Porter and Charles dishwasher and continuing the trend, a Porter & Charles stainless steel dual fuel gas range. The faucet with pull out is by Grohe and there will be pot lighting and stainless steel double bowl sink with square edging. Last but not least, there is also a convenient overhang for social kitchen dining for those that prefer it. 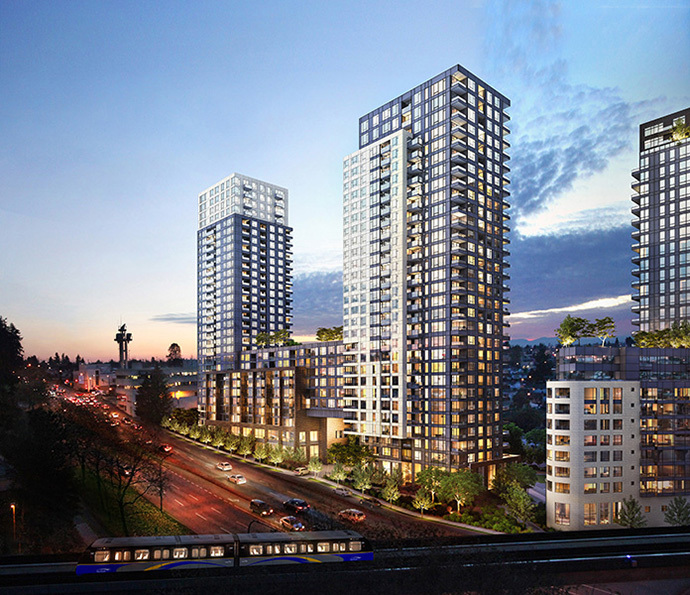 The 3rd Phase in the presale Vancouver Wall Centre Central Park Tower 3 condos will be launching May 31st with one bedroom homes starting from just $229,900. The Vancouver WCCP Tower 3 residences will be truly affordable with homes starting from under $500/square foot!